Ezekiel 1:26 And above the firmament that [was] over their heads [was] the likeness of a throne, as the appearance of a sapphire stone: and upon the likeness of the throne [was] the likeness as the appearance of a man above upon it. Ezekiel 10:1 Then I looked, and, behold, in the firmament that was above the head of the cherubims there appeared over them as it were a sapphire stone, as the appearance of the likeness of a throne. Pslams 40:8 I delight to do thy will, O my God: yea, thy law [is] within my heart. 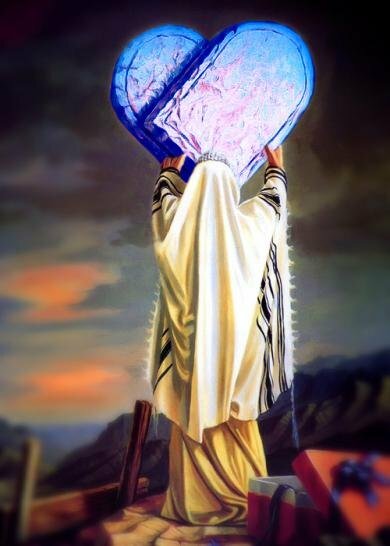 “So, the Ark of the Covenant in the most holy apartment of the sanctuary, the throne of God’s presence (the Shekinah glory), contained the blue sapphire tablets of the Ten Commandments. Hence why the Ten Commandments are blue. Numbers 23:21. When Balaam was going to curse but he opened his mouth and blessed and said, There is no sin in Jacob, there is no iniquity in Israel. There were two and a half million people camped down there in the Jordan Valley. Now God looked down that whole camp of two and a half million people. He said, I saw no iniquity. I saw no sin in Israel. Is that true? No. Why, there were sinners in there’ and they crossed the Jordan and they were still sinners.Why did God say that? That there was no sin and no iniquity in Israel? Because God had provided a blue coveting of this particular skirt over all the people. Now it’s up to them to find that out, and accept it in their mind, but the, provision had already been made. Posted on January 17, 2015, in Divine Service Sermons and tagged blue commandments, mount sinai, sapphire. Bookmark the permalink. 3 Comments. I think your assumption is that God produced the stone for the commandments, but it was Moses, and it was before he ascended Mt. Sinai. Here are the verses and an added SOP quote to support this. I highly doubt there was any sapphire laying around in the wilderness. 4 And he [Moses] hewed two tables of stone like unto the FIRST; and Moses rose up early in the morning, and went up unto mount Sinai, as the LORD had commanded him, and took in his hand the two tables of stone. And so, we have the Law of God derived from the Throne of God. Ultimately, if we follow the path of these stone tablets, they reside under the earthly representation of God’s Throne: the Mercy Seat of the Ark of the Covenant. (For those who need particulars, Moses made the replacement copy of the covenant from the original stone. Now the LORD said to Moses, “Cut out for yourself two stone tablets like the former ones, and I will write on the tablets the words that were on the former tablets which you shattered. Exodus 34:1) Interestingly, the temple was called the “footstool of God.” (Isaiah 66:1, Psalm 99:5, 1 Chronicles 28:2) This is a logical rendering, if the stone tablets were carved from the literal pavement under his throne. The Box which held the “pavement” rested in the temple.